We are nearing the end of Hispanic Heritage Month, and one of the things I put on my 2015 goals list was to support the creation of quality Latin American characters. Today, I’m tackling three common stereotypes and misconceptions. I am of Cuban, Puerto Rican, Mexican, Venezuelan and Canary Island decent. I have indigenous ancestors on both sides of my family tree. My heritage is such a mixture, even I get confused. However, I do not speak for everyone. We are too many people, with too many experiences. It’s impossible to generalizations about us as a single culture. The dominant aspects of Hispanic DNA are pretty consistent, but not exclusive. Genetic roulette is a funny thing. Latin Americans can come in any physical variation, and I’ve seen this first hand with my own family. I have light eyes while everyone else in my family has ebony chips for eye color. One of my sisters has a facial profile that would mark her as a Mayan princess in training. Her nose practically starts at her hair-line, while the rest of my family have noses with a dished bridge. Most of my relatives, including my parents and siblings are on the shorter side. However, one of my uncles was six and a half feet tall. Pictures of him bending over to hug my 4’9″ grandmother are quite amusing. Several of my family members have bone straight jet-black hair, others have light colored or wavy hair. One of my kids has textbook dark coloring. While my other kid has sandy almost blond hair, with blue eyes, and skin so fair it’s a nightmare keeping the kid slathered in enough sunscreen. We are predominately a group with Christian sensibilities, and Roman Catholicism is the single largest religious influence. However, many people are moving away from strict Catholicism, and embracing other faiths. And there have been large Jewish communities in Latin American for hundreds of years. My Cuban born and raised grandmother called herself a good Catholic, but her beliefs were all over the place and influenced by a form of spiritualism with African roots. This blending of per-contact myths and ceremonies with aspects of Catholicism is common all over Latin America. It’s something I find fascinating and I’ve been blogging about it over at Part-Time Monster for several months now. Indigenous people, decedents of African slaves and those of non Spanish ancestry live all over Latin American. You can find people originally from almost every country in the world. And there are currently nine official languages, plus countless indigenous languages and dialects. However, historically speaking having some Spanish ancestry was considered favorable. That’s because many countries had a caste system. Spanish born people enjoyed the top spot and were called Peninsulares. The children of two Peninsulares were a step lower on the social scale. As a person got less connected to a Spanish born ancestor their social rank plummeted. Race and class are still tricky subjects for some Latin Americans to talk about, particularly within the upper classes. Bonus tip: We are name obsessed. We tend to have a lot of names; it’s not unheard of for someone to have six or more names crowded onto their birth certificate. Part of that is because including both the mother’s and father’s surname is the preferred method of naming. Also reintroducing family names back into the name stream, so family lines aren’t lost, is very important. Plus we tend to give almost everyone at least one Catholic name. I gave my kids saints’ names and I’m not even remotely religious anymore. I suspect the tradition is encoded within me so deeply, I did it unconsciously. What makes a good Latin American character is hard to pin down and no single set of characteristics is going to work. For one thing, Latin America is a huge geographic area, and each part is influenced by too many variables to count. If you want to include a character, do the research and don’t be afraid to seek help. I catch mistakes in books all time, and these are often simple issues that anyone with a basic knowledge of my culture would notice too. Hispanic Heritage Month runs from September 15 to October 15, you can learn more about the event and it’s history here. Character Chemistry: 6 Dos and Don’ts for Getting a Group Together. Question I’m curious about, in all cultures but especially since you’ve mentioned it here. In cultures where the child takes both the mother’s and father’s last name, when he/she also becomes a parent, which last name do they pass down to their own children? Both? That would make for some very long names. If not, how is this commonly done? It is most common to give Hispanic children just the grandfather’s name from both sides. However, families with a important (old and respected) family name on the grandmother’s side will often included it too. My own great-grandmother was given the sir name of her grandmother as a first name. Having a large number of names is not a big deal in Hispanic culture, or in many other parts of the world. The desire to keep track of family lines, even over long distances of time and geography, is simply too important. Thanks! That was very interesting and easy to understand! I think that your post shed light with regard to the issue and I found it very accurate and the powell stated. Thank you! This was a post I’ve wanted to write for a long time, but I had to think about how I wanted to write it. I’m thrilled to hear that you found it accurate. That was my main concern. I have a good back ground, since all of my grandparents were born in different countries, but it’s still not inclusive of every Hispanic person’s experience. There is no way to ever do that. I think that is one of the saddest things I see in books, too many authors want to make every Hispanic character a cardboard cut out of the few main stereotypes. You brought up something I don’t think many people realize and that is just how much ethnic diversity there is. There is centuries old immigration waves and much more recent waves. I think it’s what makes Latin Americans so interesting. This is not something I have every thought about before. Depending on how you classify a nickname, I think my gut response is they might be more common. Some of that could stem from our naming traditions, family names are reused a lot. My mother always used her nickname and from a very young age. However, she did attend a huge Catholic school with dozens of other girls with the same name, Mary. She never liked that and made an effort to give us less common first names. However, I honestly I can’t think of anyone in my family that doesn’t have a shortened version of their name, and at least one nickname. Most of us have two. I hope you don’t mind me zeroing in on the nickname issue when there is so much other useful information here, but I do have two more questions about nicknames: in your family and/or subculture, are the nicknames 1) shortened versions of the given name(s) (ie. I’m ‘Dani’ which is short for ‘Danielle’) or more descriptive (‘shorty’, ‘red’ (for hair)) or both? and 2) are nicknames generally chosen by the person, their parents or given by friends? In my subculture of white America, it tends to be the person or their parents but I found white Australians thought this was ridiculous; they nicknamed their friends as a sign of affection or ridicule. I have a Hispanic female character who goes by Anza which is short for Esperanza. I really want to keep the meaning of the long name but not make it so obvious. However there aren’t a lot of Anzas on twitter, for example, and I don’t know any Esperanza’s to ask. What do you think? I’m not surprised you haven’t found anyone using Anza as a first name, or a nickname. That’s a common last name. : ) I guess it could happen, nicknames can be surprising. You could try checking The House on Mango Street, the book’s main character is named Esperanza. I don’t recall her having a nickname, but I may have just forgotten. Thanks for this. One of my main vampire families is from Chiapas, so I’ve spent some time studying Latin America, but it’s always nice to have more sources! Chiapas is a fantastic example of a Latin American setting with a strong and independent identity. Keeping yourself focused on a single, and highly specific location, should make it much easier to craft a good character. It will be interesting is see how you incorporate the area into a vampire fantasy. This was really informative and actually really interesting, too! I didn’t know much (and still don’t) about Hispanic backgrounds but now, thanks to you, I know at least a little! I never used to like History classes at school but I found your bit on ancestry and naming traditions quite interesting. Thanks! The post is just a very basic introduction. I just want to help fellow writers start thinking about adding some character diversity to their books. The world is an amazing place. And it’s filled with interesting traditions. It’s a same more of these cultures and their histories don’t make it onto books. Thanks for this post. 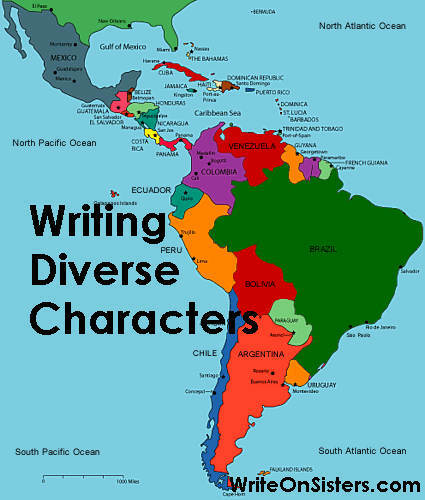 I am working on a novel that has some Hispanic characters, but I am from an area which is not exactly diverse. I struggle to make sure that I don’t misrepresent, but the characters are illegally living in the US, which is fairly common. I discussed this issue with a friend of my niece’s, who is himself illegal, to find out different cultural differences that might apply to the story. One thing I learned was that the older generation doesn’t usually speak English, even if they have been here awhile. They don’t really feel a need to assimilate or even necessarily want to. (As you said, I don’t speak for all, just this source I had.) Given that some of the characters in my novel are of this older generation, is it ok to represent this with a sprinkling of Spanish words, or phrases, as I suspect most of my audience will be English speaking? (Although I would love it if this wasn’t true!) Particularly given that the character is speaking to an English speaking character, with some Spanish knowledge? On the positive side, I’m so happy to hear you’re trying to reach out and gather some first hand information. Good call! However, you should try to find a few more people to interview. Also do lots of research, research is your friend. And I highly recommend you look for some Hispanic beta readers, I suspect they will be critical to the success of your project. Now for the hard stuff, you should know that by starting with characters that are illegally living in the US and are resistant to learning English, you are already treading on some common stereotyping ground. I think you’re correct in assuming you need to be careful about how you write these characters. I just want to add one more thing. The number of US living Hispanics I’ve known in my lifetime that have refused to learn English is pretty darn small. Most Hispanics want to learn English, and they want their kids and grandkids to learn. They understand the only path toward college and finding meaningful success in the US is by learning. However, it is not easy for older generations to learn a new language. That is simple biology, the older you get, the harder it is to rewire the language portion of your brain. And pride runs deep in our culture. Saying they don’t “need” to learn might be their way of masking the failure they feel at being “unable” to learn. Reverting to your native language is always going to be more comfortable for everyone, not just Hispanics. And there are communities all over the US where a person can do almost everything they need to do in their native language, and that’s not just for Spanish speakers. Just something to think about.